Allow your guests to kick back and relax with this Grosfillex US876552 Calypso beige / white stacking adjustable resin sling chaise! Made of sturdy, long-lasting resin, this lounge provides superior strength without the hefty weight of comparable outdoor lounges. Not only is its comfortable sling seat made of Microban anti-microbial treated textilene fabric to resist mold and mildew and prevent sagging after extended use, it's also UV resistant to ensure its attractive color won't fade when exposed to direct sunlight. Plus, thanks to the fabric's breathability, it dries fast after becoming wet from rain or a power-washer cleaning. 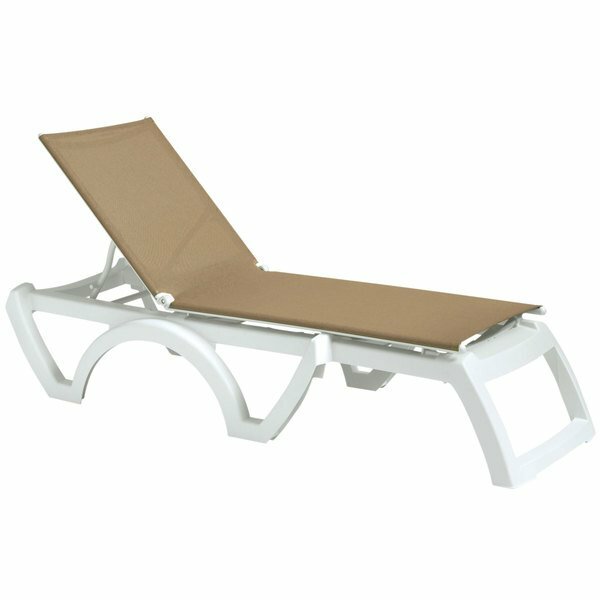 ASTM rated for commercial use, this luxurious chaise lounge offers guests a way to lie down and rest next to pools, on beaches, or at spas. While the 4 position adjustable design allows guests to move the back to best fit their needs and comfort level, the recessed wheels promote easy relocation from one spot to the next. It also features hard-wearing footpads for extra resistance when placed on rough floor surfaces. Boasting an ample 300 lb. weight capacity, this attractive, beige and white Calypso lounge guarantees comfort as your guests recline and unwind on your outdoor deck or patio.